Trained as an Medical Doctor in Belgium, Marc Van Cauwenberghe discovered macrobiotics after coming across a book by George Ohsawa. It fascinated him and was the start of a lifelong journey into macrobiotics. He went to Boston in the early 70s to study with Michio and Aveline Kushi and later became a prominent teacher of macrobiotics around the world. In addition, Marc has become the world’s foremost scholar of George Ohsawa and his works, gathering every published and unpublished work that he could find in all languages including French and Japanese. Also, with Michio Kushi’s assistance he has collected and transcribed all of Michio and Aveline’s works. Looking forward to the talk by Mark. hallo Marc thankyou for the interesting classes you gave me, many years ago, from when you broke your arm, and how you healed it. to the great book you wrote on medicinal facts with food. If you were to write a book today in the same vein what would you add now after all these years thankyou for your dedication sincerely Claire Daring formerly Pound. I enjoyed knowing how many translations GO’s material went through before it became English. I enjoyed the insight about Michio Kushi’s illness. I enjoyed hearing your story about how you got into macrobiotics. Especially how surprised you were when such difficult cases were cured right in the beginning while you were still fairly new at it! I forgot the most important thing: Thank you for your time last night and all your efforts throughout the years! So great to hear Marc Van Cauwenberghe speak again after all these years. I was a student of his back in the early 1980s and always enjoyed hearing his insights. Thank you for sharing this communication. 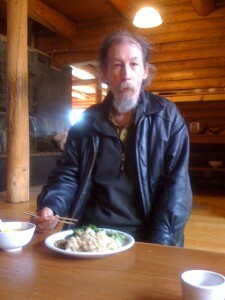 May he continue to inspire many people to follow the macrobiotic way. Hello, i saw you on the veria channel and would like to know if you come to new york and do you still do readings? please contact me i was diagnosed with lung cancer and started doing the macrobiotic diet in november but was having a difficult time. If you do not come to the new york area i will come to you. Thank you. I am sorry to hear that you didn’t mention Dr. Maurits Meganck. He was a pioneer in Belgium! Het zal je zeker interesseren. Na 35 jaar macrobiotische praktijk is het moment aangebroken voor een reflectie. Kan je me jouw e-mailadres doorstuen?